Be Amazed! Bright, Spacious Contemporary Riverfront Home in Magical, Tranquil Grove of Redwood Trees, Woodstove, Hot Tub, Lawn, Seasonal River Access/Boats. Wi-Fi, Landline Phone, Cable TV. Keyless Entry. Short Drive to Town, Coast, Redwoods, Golf. Your Well-Behaved Dog is Welcome! On the first level of Amazing Place, the living room and kitchen are open plan with a dining area. The sunroom and one bedroom with its own bathroom open from the living room. 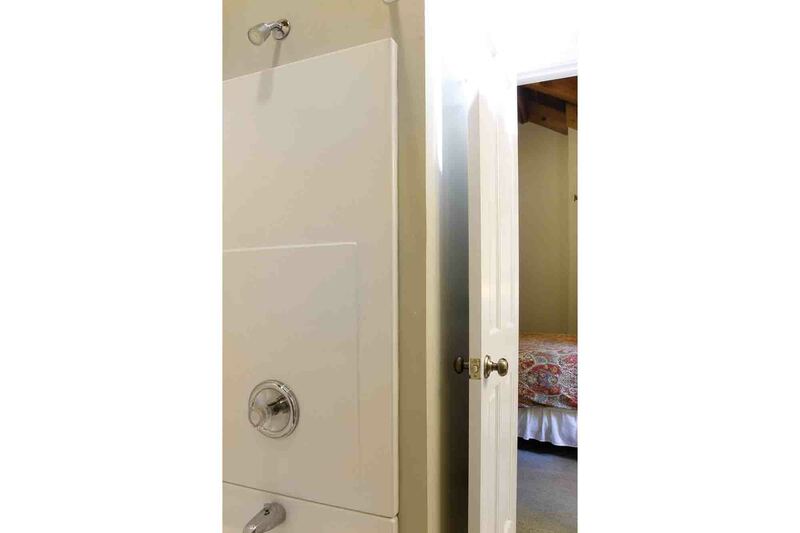 On the second level, there are two bedrooms with a jack-n-jill bathroom. The sunroom opens to the wrap-around deck, outdoor dining, and hot tub. There are steps from the deck to the rear yard. The rear yard has a large, greenbelt lawn, and there's a path to the seasonal river access. At typical summer water level, the riverbank usually has a short drop to the water. House is approximately 1360sf. Max Occupancy: 8. Max Automobiles: 3. Quiet Hours 10pm-7am. No outdoor amplified sound at any time. Central Heat, Woodstove. No A/C. Please bring your own spa/beach towels, toiletries, and firewood. Exactly as advertised, clean, easy check-in, beautiful views and clean and comfortable beds. One of the better places we've stayed with regards to delivering on exactly what the listing promises. "Really great place for families"
Really great place for families. 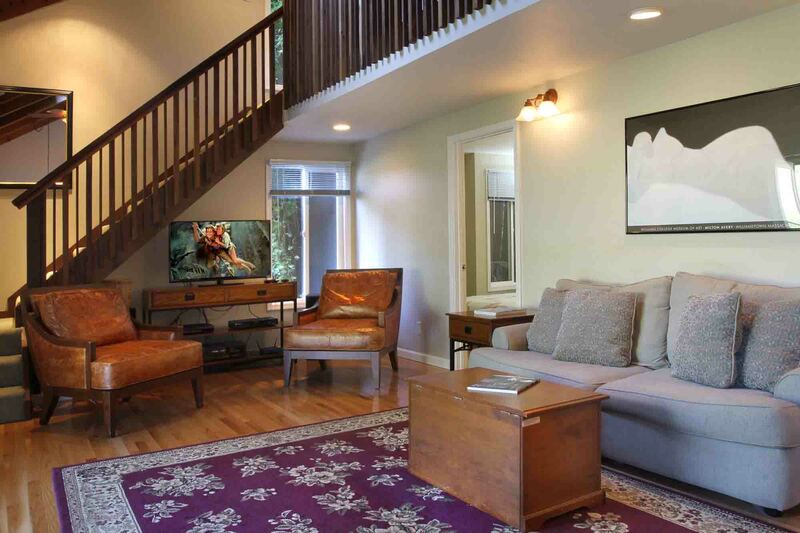 Lots of space, some games and toys for kids, cozy soft carpeting upstairs, great access to the river, and a beautiful barely-traveled street for stroller walks. We went hiking right from the house. We also loved the restaurant in Duncan Mills and the easy access to Jenner, Shell Beach/Kortum Trail, etc. We will likely book this place again, and will be telling our friends with kids about it too. "The setting and location are very nice." The setting and location are very nice. However, we found the lodging lacking. Dishes were dirty, it was hard to heat, if you have a guest staying in the sunroom sofa bed, they have to go into someones bedroom to use a bathroom. There were few amenities like salt, wood for the fire. It was cold, and the house gets no direct sun, but it does have a beautiful view from the sun room. "The view is breath taking!" This place was awesome and the view is breath taking! 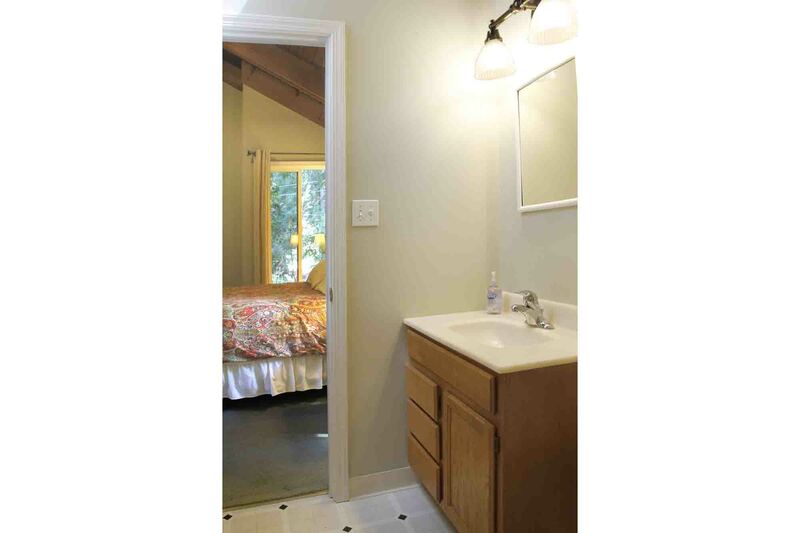 "This is a wonderful, cozy cabin"
This is a wonderful, cozy cabin beautifully situated on the Russian River. All the beds in the house, including the pull-out sofa, were comfortable. The kayaks were a nice touch - my friends and I took them out on the river both days we were there. The water was calm and the scenery was absolutely gorgeous. The cabin is on a narrow, unlit road, so the hosts will advise you to arrive before dark, because it might be hard to find otherwise. My group came in three separate cars, two of which arrived well after sunset, and nobody had any problem finding the place. (Hidden by Airbnb) Maps takes you right to it, assuming you have cell reception. Those of us in the group with Verizon had good reception throughout the weekend we stayed there. I'd definitely come back here! "We created a lot of family memories"
This place was amazing! It exceeded our expectations. We came to visit for Thanksgiving with our 5 adult children and our pups. We created a lot of family memories for years to come. 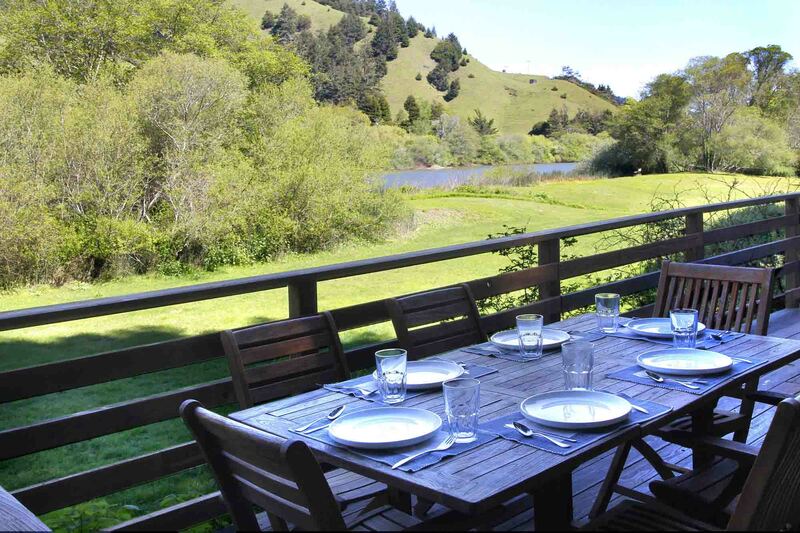 "Superb location by the river"
Superb location by the river with views of the hills and plenty of outdoor space. The sunroom is a sight to behold and perfect for relaxing in with your morning tea. 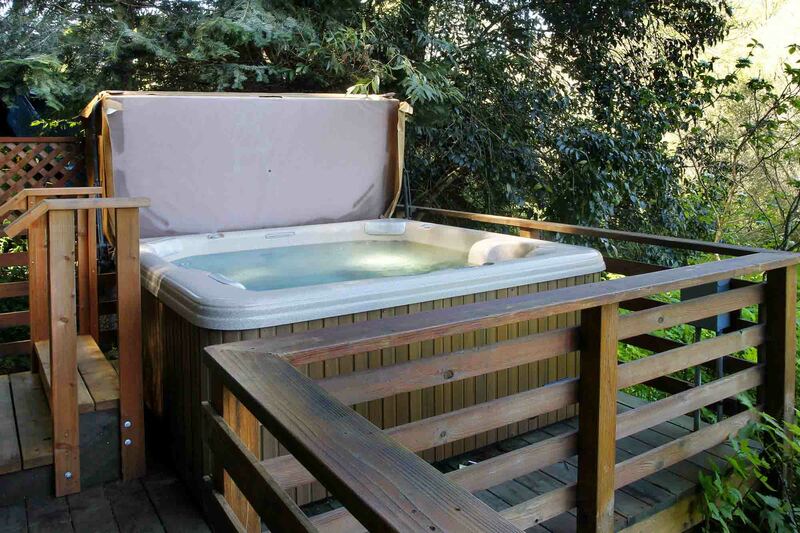 Relaxing in the hot tub while looking at the incredible views and the surrounding redwoods was the highlight of our stay! We love to cook so we were pleasantly surprised by how well-stocked the kitchen was - everything from food processors, blenders, coffee grinders, and lots of pots/pans/utensils. Didn't end up turning on the furnace during our stay but can imagine it making the space feel extra cozy on a chilly night. "We were sad to leave!" We loved staying here. The hot tub was great, and we loved building a fire every night. The house was warm and cozy, and the couches and chairs really comfortable. The table was big enough to fit all of us for sit-down meals and to play games around. WiFi was also awesome. We were sad to leave! Fun house. Hot tub was nice. Would have used the kayak if it would have been warmer. The river was beautiful. Make sure to get there in the day time as suggested as is hard to find as well as no cell phone reception. 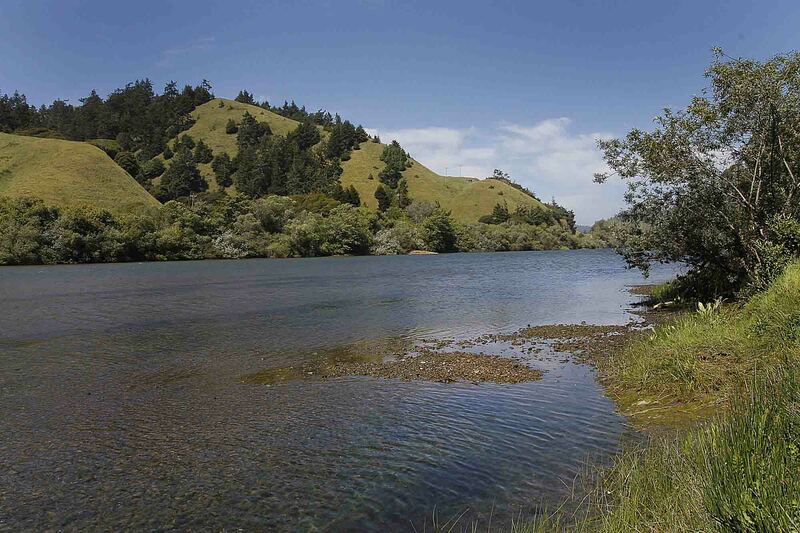 Great location, wonderful kayaking on calm Russian River and the hot tub was great! We enjoyed our stay. The hot tub and kyacks were especially enjoyed. Cozy stay with pets with access to river. "Beautiful place to be for a relaxing family getaway." Awesome getaway at amazing place. Beautiful place to be for a relaxing family getaway. View from the deck in early mornings were spellbound. Foggy mountains, grazing sheeps and chirping birds. Spent most of the time in russia river with the provided kayaks. Board games in sun room and hot tub in the deck kept the kids and adults busy. 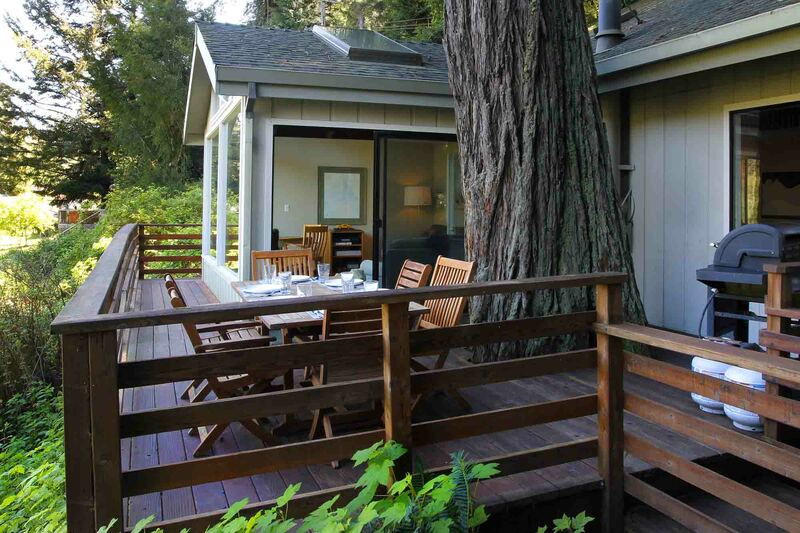 "Extremely quiet, safe home surrounded by the magical redwoods"
A very nice secluded location. Extremely quiet, safe home surrounded by the magical redwoods. A nice walk to town, a little over a mile, offering a wonderful grocery store, bakery, post office and a number of gift stores with beautiful things. House is a tad worn but offers the basic amenities. 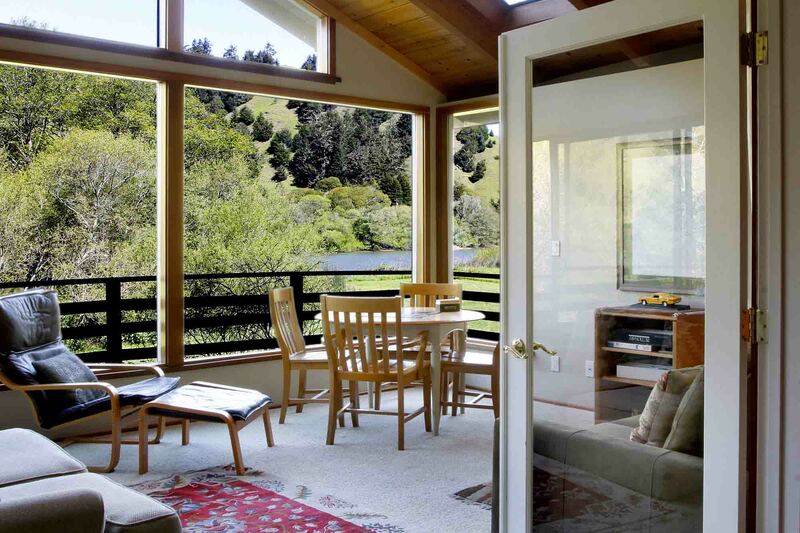 You will find the sun room to be a wonderful place to hang out as you watch the goats, fox, deer, cow roam the hill side. Bring your binoculars and hiking shoes. Great hiking trails to access just down the road. "Beautiful setting and a cozy"
Beautiful setting and a cozy house! We spent all day on the river on the kayaks and spent all evening on the deck grilling or soaking in the hot tub. We also loved the big lawn where our dog could run and play. "great home with beautiful views"
If you enjoy an outdoorsy view then this is the place for you. You can see a small portion of the river(what the picture shows). I also liked looking at the big grassy hill across the way. We were able to see deer near the house and on the hill. We saw big and small birds . Beautiful yard between the house and the river, but best of all I loved the big tall redwoods. All the views are out the living room, dining room, deck, and sunroom. It is a great home with beautiful views. It holds 8 people very comfortably. Thank you for sharing your home. "Lovely home in peaceful setting"
Lovely home in peaceful setting. Easy communicating with host. Clear instructions. Had a very restful getaway. Very quiet, remote location close enough to the river to see small segments of it. Access to the house is down a very long, one-lane road. As the hosts stated, it's best to arrive during daylight hours. There is a nice view behind the house of hills, trees, bushes along the river, and a small part of the river in a couple of spots. The house instructions were very thorough and communication with the host agency was excellent. The house itself is large and comfortable. The beds were also very comfortable. The kitchen is well-equipped with dishes, glassware, pots, pans, and cooking utensils; however, be aware that you need to bring your own cooking oil, spices, coffee (there's a gold filter in the coffee maker), sugar, condiments, etc., as well as matches or a torch lighter with which to light the wood stove and gas grill (the igniter wasn't working). As stated in the listing, well-behaved dogs are allowed; however, be aware that there is a very strong pet odor in the house in care you have allergies. "Great house with beautiful views!" Great house with beautiful views! My only criticism is that the hot tub could use replacing. Otherwise we had a wonderful stay! "Amazing place, with a large yard and river access. " Amazing place, with a large yard and river access. 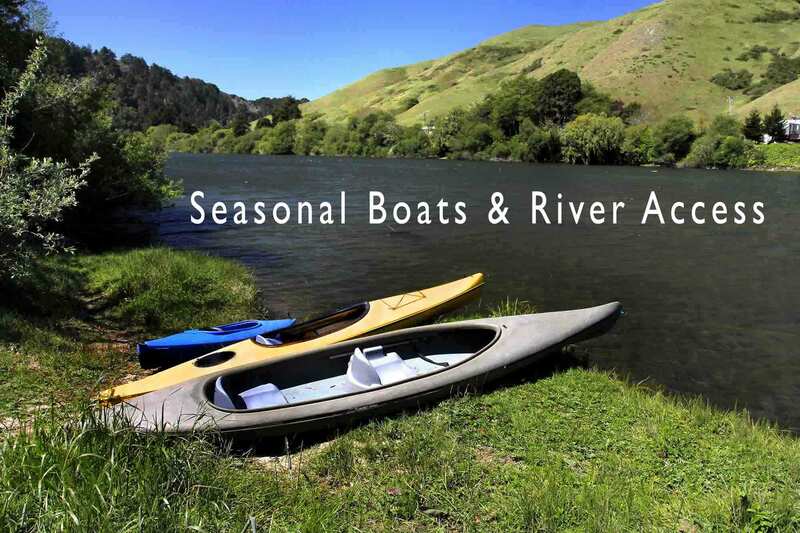 Highly recommend to anyone who wants to spend some time on the Russian River. There were 8 of us and it was plenty of space. A great find! The proximity to the river and the view from the sunroom were amazing. "Great location and beautiful views." Great location and beautiful views. The beds are particularly comfortable! Great spot for relaxing. The house is very private and has a good layout. 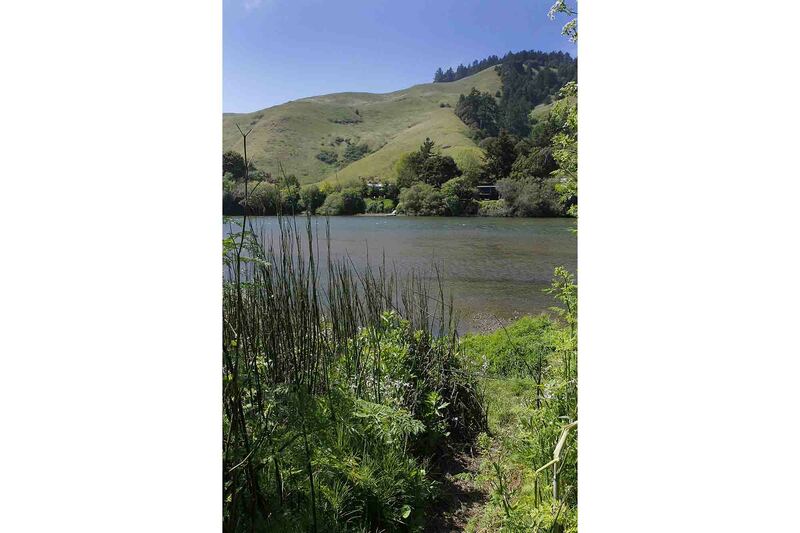 It is very convenient to a lot of different areas in Sonoma County - especially the state parks along the coast. It's a beautiful retreat. The view looking across the river and sheeps roaming hills makes the whole experience! "Highly recommend staying at this lovely space"
Highly recommend staying at this lovely space. 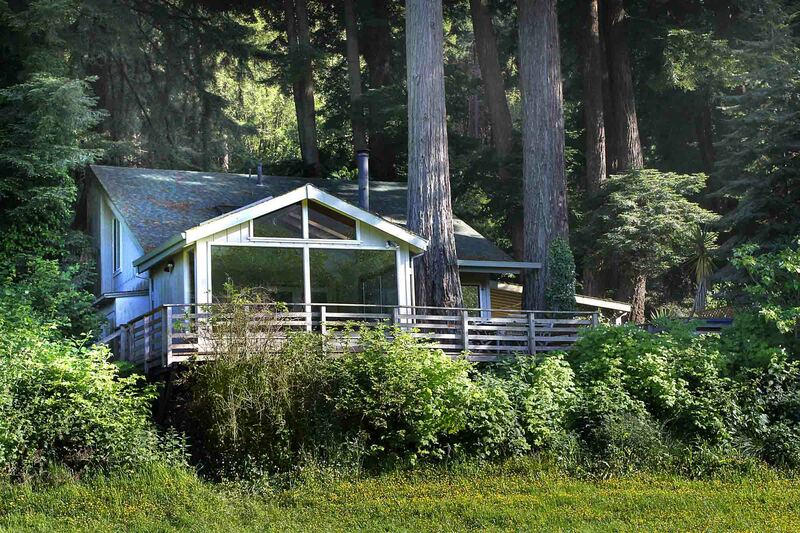 The house was beautiful, the location was perfect (within a few minutes drive of both the ocean and the redwood forest, and right on the river), and the hot tub was a lovely addition to our trip. Would definitely return! "This was a beautiful spot off the beaten trail"
This was a beautiful spot off the beaten trail. The home was modest but comfortable - just the kind of getaway we were looking for. Justin and the River Getaways team were lightning-fast responding to requests. Great place, great service, great value. Would highly recommend this place. Great place! Inside was even better than expected, with lots of room to stretch out and lots of tables to lay down board games. Beautiful view across the river and close to the ocean. The River Getaway was a perfect stay for our family Christmas. The Check-In information was received just before the trip, making it very easy to share directions and details with everyone meeting together at the house. WiFi was great, which is important since the cell service is a bit spotty in the area. The house is close enough to town to make it a nice walk, but far enough out to feel secluded on the river. Amenities were excellent - comfortable beds, awesome hot tub, washer/dryer and a fully stocked kitchen with everything you need for coffee, cooking and baking. We would definitely return if we are back in the area! "We had an amazing stay at Amazing Place!" We had an amazing stay at Amazing Place! Quiet, serene, and scenic, it was perfect. We'd stay again or recommend to others in a heartbeat. Especially loved the sun room and the fact that we had three kayaks to use. Our host was very responsive and communicative, which made for an easy, seamless experience. Thank you for sharing your experience with us as hosts and the amazing Amazing Place (which is pretty amazing! ), Amie. We do hope you'll be able to come back soon. "Great place in a quiet neighborhood..."
Great place in a quiet neighborhood a short stroll from the water and river access. Hot tub has great jets, view of the hills is lovely, and the beds are comfortable. We enjoyed having access to kayaks and had several nice boating expeditions (a seal joined us for one of them). One nice feature is the large kitchen table for having group meals, and the sun room has a sofabed and is a great place to drink coffee in the mornings. Thanks! We had a very relaxed time. We kayaked from Duncan Mills to Jenner!! Such an excellent kayak trip on the estuary of the Russian River! We're so glad you enjoyed your stay at Amazing Place and hope you'll be back soon! "This is an amazing place"
This is an amazing place. Super close to river and duncan mills. Such a comfy large space! Great amenities! Thanks for the review and feedback, Vivek. We're glad you enjoyed your stay at Amazing Place! "Very comfortable home but getting close to needing an update on appliances and kitchen"
"Nice house in a beautiful setting"
The house was lovely in a beautiful setting. I have a VRBO myself and I have a few suggestions for the owner or managing company. It is so nice to have a bar of soap available to use in the showers after a long day of travel. Kleenex is another very inexpensive additive which is pleasant for your guests to have. It has a lovely grassy area near the river but there are not any lawn chairs to sit on. A few plastic aiderondack chairs and perhaps a firepit and we would have been able to enjoy that area. It is a little bit of a trek to get the kayaks down to the water but it is a lovely river. Good to go in the morning before the wind kicks up. Great bakery in Duncan Mills for coffee and breakfast. We enjoyed our stay but would recommend paying attention to some small details to make guests like they have everything that they need. Would either recommend a new fridge or fix the doors. The duct tape was not real effective. "Loved the Russian river valley"
Loved the Russian river valley. Make sure to check out the local places in Duncan Mills. Great bakery and restaurant. "Had a wonderful family vacation. " Had a wonderful family vacation. Great river access. We love Duncans Mills. "True to its name, this is an amazing place..."
True to its name, this is an amazing place for a peaceful retreat on the river. Great views from the sunroom and porch and kayaks to enjoy the river up close. The kitchen is well stocked with everything you'll need and there's a great gas grill. Overall, very comfortable. The management company was very responsive and helpful as well. A lovely three-bedroom house in the redwoods, a short walk on a path to the water, really enjoyed the kayaks and the hot tub was great. Beds were comfortable & there was central heating as well as a wood stove. Kayak downstream or up to find great swimming spots. The large table inside was great for formal meals. The sunroom has a pull-out sofabed which was reported to be quite comfortable, and the glass doors to this room closed and you could pull curtains for privacy. Double-paned windows made this a great sleeping choice for an extra person. We mostly used it for soaking up sun and gazing at the hills beyond and the abundant birds. The road was quiet and not far from the Blue Heron (live music and oysters) and the Gold Coast Bakery (get the bear-claw or fresh pizza, eat it on the sunny porch with hummingbirds). The yard was overgrown so don't plan any football games here :) but overall a great spot and a good value. Cute house with a beautiful view! Thanks so much for the lovely review Elizabeth! We're so glad you enjoyed your stay. Beautiful, quiet location. Great place to rent with family or a group! "Great spot right by the river! " Great spot right by the river! Sunny patio room, comfortable beds. Shared bathroom upstairs but we all made it work. Would stay again. "Great location along the river..."
Great location along the river, with a beautiful view of the hills on the other side. 15 minutes to the ocean and 7 minutes to a great little collection of shops including a grocery store and pretty legit wine/cheese shop. You're not going to find luxury accommodations along the river, and the neighbors are very close but were quiet. It's a little grungy but was comfortable. Check in and check out was very easy. We enjoyed this lovely home! It is well appointed and a great place for a group of friends. 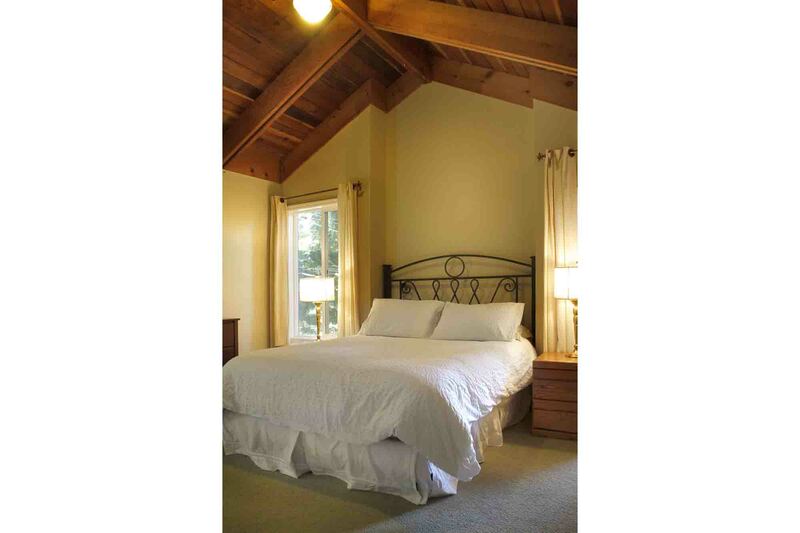 Russian River Getaways is such a fantastic rental company! They are very accommodating, responsive and wonderful to work with! Their entire inventory of homes are clean, taken care of and perfect for any family get away in the woods! We loved our stay at Amazing Place! It was the perfect size for our little family, which included three adults and three small kids and our goldendoodle. We really loved the sunroom, and spent much of our time there watching the deer that came in the mornings and evenings to the meadow below. We didn't use the hot tub, but enjoyed dinner on the deck. The kitchen was functional, but basic and could uses some smell freshener (like lemon) down the drain. The house was a short drive to Duncans Mills village shops and restaurants, as well as Jenner, and required about 15 minutes to get to Guerneville. The property and view are truly amazing! Love this place, been here a few times. A few upgrades are needed: gas grill needs replaced ( barely functions)and kitchen amenities were poor this visit. Items are needed such as more cutting boards, kitchen towels, cooking pans, seasonings. Rentals used to be better stocked in past. Don't want to have to pack and bring my entire kitchen, especially at the price paid. Clothes washer is in poor shape. It truly is an amazing place. It was well maintained and had everything we needed for a very wonderful visit.Some 'bewares' for the next guests -- there is an abundance of stinging nettle plants along the wooden stairway down to the river. Do not touch and keep your children away.The bungie cords to keep the lids on the trash cans do not deter the raccoons in any manner. All food items must be kept in the house at all times. The raccoons are very bold and not afraid of humans.There are no full length mirrors in the house (of note to a bride on her wedding day and couldn't tell how she looked before walking down the stairs). The community of Duncans Mills is the best. Make sure to take time to check out the shops. The General Store has many locally produced items. The Blue Heron is a terrific place to hang. We thoroughly enjoyed the wine tasting at Sophia's Cellars. Meals at Cape Fear are very enjoyable with outstanding service.We were there for our wedding at The Rivers End in Jenner. An amazing Place made the weekend even more special than I could have ever imagined. This house is better described as "basic utilitarian" as opposed to "idyllic retreat". The house is clean, with a well stocked kitchen and a nice hot tub. The view out the back is lovely--in its very natural state. No trimming, raking, planting or pruning is done around the outside of the house to enhance its beauty or improve the view of the river. The house is sparsely furnished with an eclectic selection of furniture reminiscent of piecing together our first homes; small oak bookshelves,small chrome and black TV entertainment center, bargain basement curtains and a few pictures. The sofas seem new..and functional.. but there is no warmth or coziness there. A few more chairs in the living rooms would help tremendously. Both upstairs beds are very comfortable but the master bedroom is a futon that was far less so. 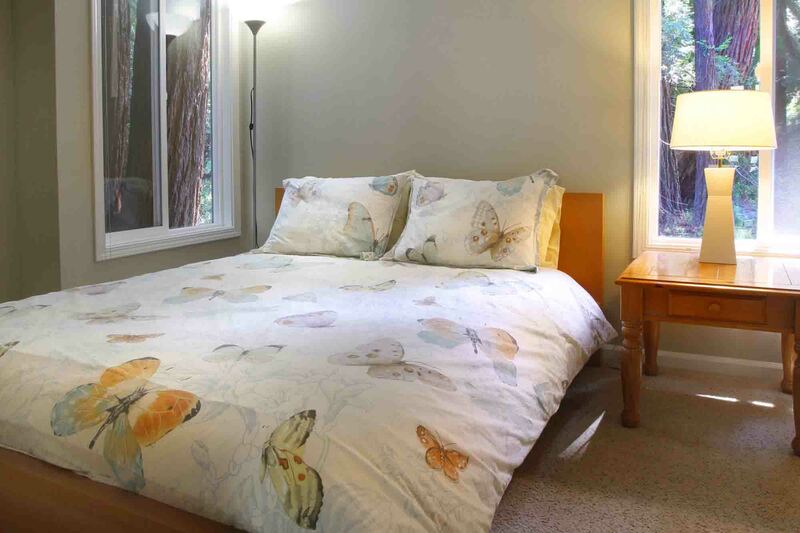 The linens are similar to those you take from your closet to give your kids when they get their own apartment--a bit dingy and very wrinkled. There are no extra blankets for the beds. The sofabed is comfortable but we could not find a duvet cover for the comforter. There were no coffee filters, tissues, bathroom soap, reading lamps or night lights. If it the location, and not the feel,of the house that is important to you, then this is a good one. Duncan Mills is a great town, hikes are nearby and there was plenty to do during the day. This house was a bit more expensive than others, but given its location and the website pictures we thought it would be ..well.. amazing. This is the fifth time we have rented from Russian River Getaways and it may have been the best house yet. The house has a well stocked roomy kitchen, is very clean, has great common space, and the views from the sunroom were spectacular - a great house for a multigenerational family retreat!We usually stay in Guerneville and initially were a little worried about being so far away but the peace and quiet of the area more than made up for the short drive to the Safeway in Guerneville and we had a wonderful afternoon browsing through the Duncans Mills shops.Given that the house is so tucked away in the redwoods (and so close to Jenner) it doesn't get much sun and is a little chilly, so be sure to bring your sweatshirts! I love the sun and was a little dissapointed that the deck stayed so shady but the meadow was almost always sunny and that was a great spot for my grandkids to run around. Next time I would pack a few lounge chairs to take down during the day.The only thing that could make this house a five in my book would be if there was seating down in the meadow and more of a beach and/or dock down by the river but these are small things and overall a great time was had by all!Our family would definitely stay here again! "Come for the River, stay for the art Collection"
Le Louvre, The Hermitage, El Prado...none can compare to the majesty that is...Amazing Place! As I leisurely toured the art collection housed within those hallowed walls I felt a rush of the sublime verging on the sacred. The plexiglass poster prints neatly framing the pleasantly worn sofa, my senses delighting in the play of color suffused in the repro liquor advertisement and the pile of board games below. Michelangelo himself could not have felt such intense rapture as we, just before hopping in the hot tub and sucking down a bottle of Chardonnay. 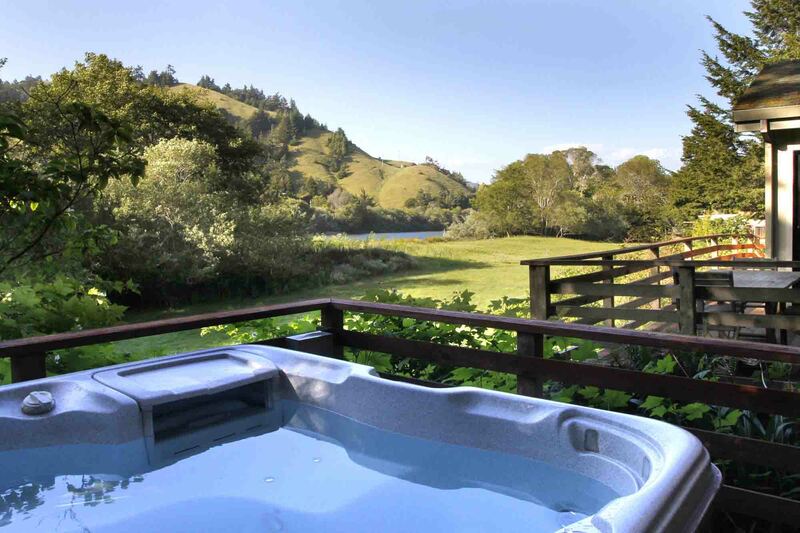 Thank you Russian River Getaways! Well, the view was amazing, but the state of the house was not. Some curtains were dirty, yellow spots on sheets, kitchen very poorly stocked, no covers for pots. The tv/dvd didnt work.The house itself is in shaded spot which makes it run very cold even when it's hot out. We had to run the heat most of the time.The view is gorgeous, and the river is lovely. It's great that's dog friendly, we have one and he loved the river and the lawn. The negative is there were spots on the carpet not left by my dog, but he was sniffing those all the time. I was nervous he'd mark, but he didn't. Very good boy. "The cool charm of amazing Place"
We had an extended family vacation here for one week. The house and its accomodations were good; the views of the river and hills beyond are lovely. The house is set among Redwood trees, so it was always cool inside. It would be useful to realize this even though it was summertime and be prepared with warmer things.The kayaks were good, but the entry to the river is difficult. Also some lawn furnture would be great when the sun is out the lawn is very beautiful.Duncans Mills is a nice walk away, and the Bakery and cafe are very lovely. We really liked the home! the living space &amp; kitchen area were really nice and the kids were able to play in the sunroom, so it didn't feel at all that we were 8 people in the home. The only thing that we didn't like was the bed downstairs (the one that folds out from the couch), the springs on it are so close to the mattress, it seems that you are sleeping on the springs. We couldn't really even use it as a bed. Aside from that the home was great! "Relaxing weekend on the Russian River." We took my Mother-in-law and Father-in-law to the Russian River for my Mother-in-laws birthday. 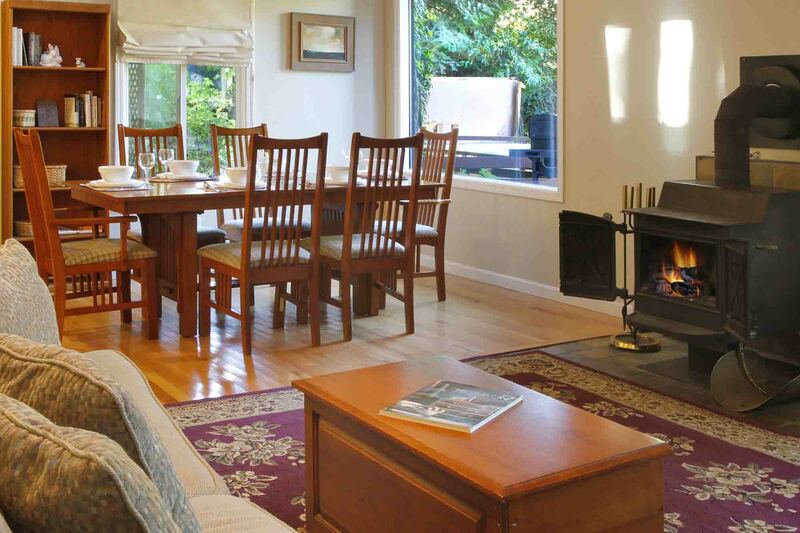 The house is wonderful and has everything that you will need to have a relaxing stay. It is easy to find and close by Duncans Mills and not a too far drive to Guernville, so if you forget something it will be easy to pick up. The lowest temps of the season were going on while we were there. I will have to say it is more enjoyable at the Russian River when it is warmer, but that was not something that could be controlled. The rooms were nice and very clean. This was the cleanest rental house I have ever stayed in. If you have allergies or you are worried about dust from old couches bring a blanket from home to cover the couches with because they are quit old. The only negative that I would have to say about the house is we could not get the wood stove to work properly. The damper does not seem to work correctly (or it is too difficult to operate) and smoke flows into the house. 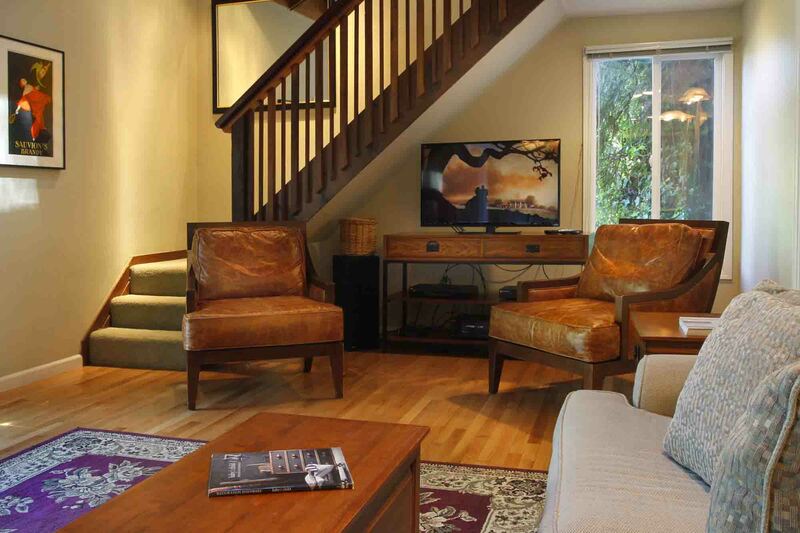 This is one of the best houses that you can stay at on the Russian River. Very nice over all. "Cheesy name, 100 percent accurate"
We spent New Years eve here and couldn't be happier. The outdoor hot tub was bubbling when we got there, and there's a redwood tree *in* the backyard, so when you're in the tub, you're looking up at these immense trees. Beautiful! This is a perfect place for a group of friends who just want to hang out.It's a nice walk into town, although don't expect to do much there. Grocery store (safeway) a few miles away in Guerneville. Go here to be with the people you're with.Very minor quibbles: we couldn't get the grill to ignite, and the pullout couch-bed in the living room is a little uncomfortable (although there are enough couches to sleep on). Absolutely nothing that should detract from a stay here. Stayed over the Thanksgiving holiday with some close friends. We had a great time kayaking, bike riding, walking, hiking &amp; cozying up to the wood burning fire after a night 'swim' in the hot tub. For the most part, it had everything we needed and was the perfect place to get away from it all. On Thanksgiving, as we gathered around the table, the electricity went out. After an hour, we called the emergency number and were surprised to make human contact. He was very reassuring and called to give us updates from PG&amp;E.; A++ in our books. The only two things I would suggest they fix to get to 5 stars are: 1. Some of the lights were burned out. Make it a habit of checking in between guests.2. The door code to get in/out of the house changed the day we were checking out. Thankfully, we found a piece of wood to keep the door ajar so we wouldn't be locked out while packing up our stuff. We would definitely return! I was really looking forward to our stay at Russian River, this was our first trip to Russian River. From the advertising of this place we though we were going to have a great get away. It was horrible from the minute we stepped in, the place smelled horrible, musty, moldy oder. The place was old and dirty, spider webs covered the lamps and every corner you turned. We had to wash all the dishes before we used them because we were afraid of mold. The sheets were not clean, there was spiders and hair in the tub where I had to give my 1.5 year old son a bath. We coulnd't even sit outside the patio because it was so dirty. We didn't have a great view of the River because there was over grown bushes and srubs covering the view. My husband had to purchase light bulbs just so we can have some light. We purchased candels so we can get some of the oder out. It was a disappointing stay and I would never stay here again! The house is beautiful. The location wonderful. We spent some very nice times on the river, in the hot tub, and exploring the amazing parks nearby.The issues: the house sits in a (beautiful) redwood grove and gets little sun, so we were surprised that we needed to turn on the heat. The carrying handles for the largest kayak were broken, so transporting it to and from the river was a challenge.The kitchen had several broken implements (we couldn't get either can opener to work, for instance). The house was as expected. Similar to other rentals in the area. I spent a weekend here with 7 girlfriends and it was a comfortable stay where no one had a desire to leave the property. Our dogs loved the grassy area and keeping them in front of the property was no problem as it's quite large. We did wander through the neighboring yard to access the river (no beach this time of year) and had no issues. The sleeping arrangements worked out wonderfully and we spent the vast majority of our time on the deck and in the hot tub.It was a great stay and we all wished we could've stayed longer. Better river access would be important for future rentals in warmer weather, but for a cooler time of year the hot tub suited us just fine. The place is lovely. Wish we could have used the kayaks but the river was too dangerous... The place is lovely. The people running the operation were fabulous, easily available to answer questions and take care of issues.Only problem might be that you have to go through a bedroom to get to the 2 bathrooms... but that wasn't much. Kitchen is well equipped. 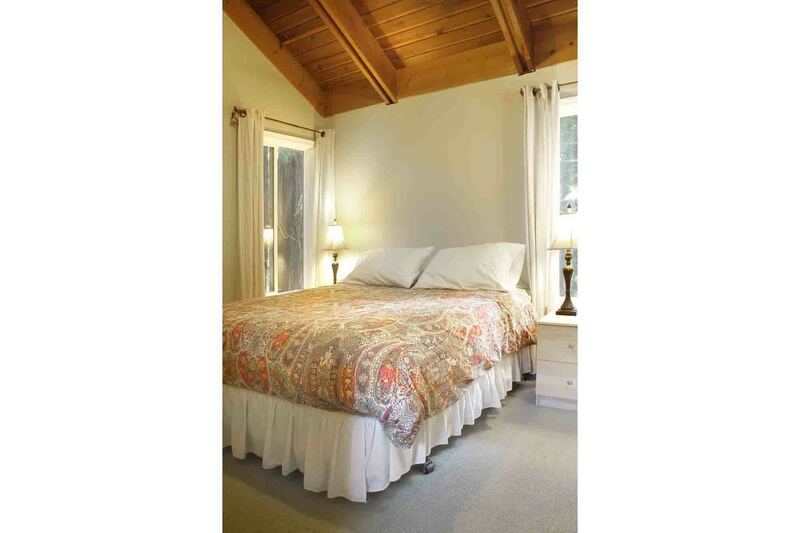 Comfortable roomy house, with very quiet location - nice walk to Duncans Mills. In the redwoods, so somewhat dark. Generally well equipped kitchen (though could do with sharper knives!). "Good for families and children"
We felt comfortable with young children and enjoyed our time by the river. I have mix feelings about staying at the amazing Place house. The house is situated in a nice secluded and quiet area. It was clean and the house was functional. However, because the house is built by the river and in the shades, the house was freezing even in the day time when it is very hot outside. It was so cold that we had to turn on the heat to 90 degree to keep the house warm due to the high ceiling. The house has no insulation either. The kind of cold I felt was moisture or damp coldness especially on the main level's room. It's not your regular kind of cold. We left the heat on all day and night, and we were comfortable. The area rug in the living room has that sheen of sticky feel to it. Like food or drink have been spilled on it many times and just got wiped up or air dried. It really needs a good wash and scrub or replaced. Although the house is walking distance to the river, but you cannot access the river and play there like a beach. The high grass prevents you from accessing the river. There is a small pathway, not kid friendly. We went to the nearby Casini Campground and it was absolutely fabulous there. It was only a five minute drive and so we played on the river there for two days. There is a little town closeby, but it wasn't much at all. We drove to Guernville's Safeway for food and coffee. It was a nice drive through the forest trees. I really enjoyed the drive. It is about a 15 minutes drive. Not far. Nevertheless, everybody enjoyed the stay at the house and Duncan Mills. Would I recommend this house to other people? Well, getting on to the river is not easy. The policy states that it's only to get on your kayak since the river access area belongs to the next door property, so you can't stay there. You enjoy the river more at Casini Campground. So if you're ok with this, this house is good. There's a misunderstanding here. We ask you not to hang out on the lawn in front of the neighbor's property, but the beach where the river access ends is public and you can certainly hang out there. The comments about the house being cold in June are a real surprise--we've had this house for years and this is a first! The living room area rug is pretty new and we had the cleaner check out its condition. It's clean, with no stains, no sticky anything, just a nice short weave rug. We were able to spend a beautiful weekend at amazing Place, May 2010, with friends and dogs. The house was clean and welcoming, with 3 nice bedrooms plus a sunporch. Particularly fun were: biking to the end of the road for pastries and lattes, playing softball on the large meadow, and kayaking and hottubbing. Great weekend!! Thanks so much. I've rented tons of houses, however I think this one was the best all around. The common space is warm and large and opens into the kitchen. As avid cooks, we always have to bring lots of our tools to rentals, however this kitchen had almost everything we needed. Waking up in the morning to the sun rising on the hills across the river was a great spectacle for sure. The hot tub was spacious and overlooked a very large lawn which was perfect for our daily croquet events.The town of Duncan Mills is small and quiet so pack your groceries or plan to take a 20 minute drive. Local restaurant cute, quiet and yummy. The drive to Jenner for sunest is a must.We'll for sure be back. We had a mini family reunion at Amazing Place in teeny-tiny Duncan's Mills. It was clean, comfortable, and the hot tub was relaxing. 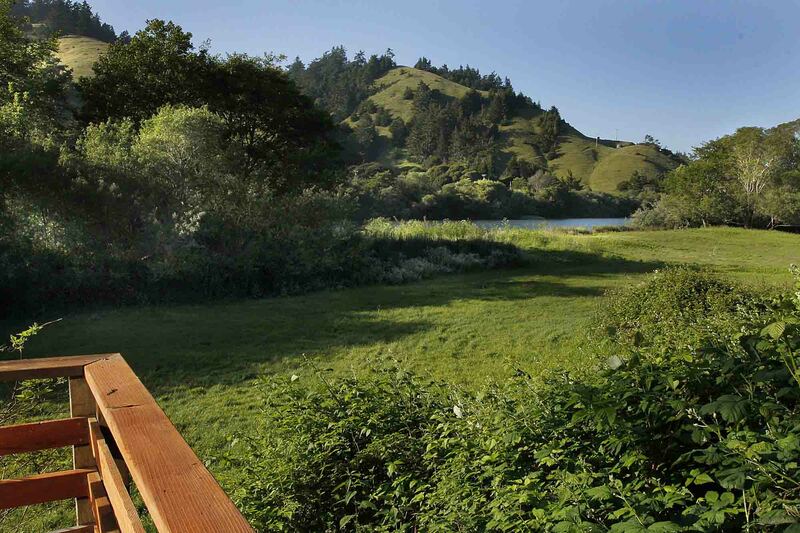 The views of the Russian River, expansive lawn, and hilltop with misted treeline from the house were gorgeous. A few of the amenities need to be updated such as the sofas in the sun room, a working vaccuum cleaner, and we had to purchase additional wine glasses and coffee mugs (enjoy them). Beds were comfortable. This is not the most luxurious place but the location can't be beat. The surprise for us was being just 3 miles from the beaches. We just loved the local bakery/coffee shop, Gold Coast, and our dinner a the local restaurant, Cape Fear Cafe, was superb. "Nice location, but needed cleaning"
The location was nice, and the views amazing. However we had to clean the whole kitchen, including all dishes and utensils before using them as there was food and stains left on them. Several chairs were broken and marked with paper signs, "broken chair." Gosh, we're certainly sorry the kitchen cleaning wasn't up to par. We have since assigned a second cleaner since one cleaner couldn't do a complete enough job in four hours. The chairs just couldn't be fixed in the four hours we had, so our handyman put a sign on them to avoid injury and they were fixed at the first possible moment. It gets difficult in the summer when houses are back to back, week after week. But all is good now! The location is great with access to the yard and the river. As it is closer to the ocean it was a little colder than we expected. The house is usable and open. The only issue is that both the bathrooms are off the bedrooms so you have to go through a private space to use the bathroom. It makes the sunroom as a place to sleep (although it has a pull out bed) not very usable. The deck is great as is the hot tub. Rented this place with my wife and 6 of her family members. We enjoyed every second of our stay. Tons of room for all 8 of us. Things we enjoyed the most: Having 3 kayaks to take out on the River was wonderful. Huge backyard to throw around the football and frisbee. Wonderfully secluded home away from any noise, very peaceful.We plan to return next Summer! "The Brothers had a great time on the River"
This could be a truly amazing place but frankly we feel it is being allowed to run down. Clearly needs lots of paint, the roof and decks cleaned off, the bbq burner replaced (if it is going to work effectively) and the major window pain replaced so you're not left with the feeling you're going to be held responsible for the crack. Great location however, beautiful views and a great, open floor plan and well maintained hot tub! Would recommend either lowering the price or doing the above maintenance if the name is to be kept. Hello, we very much appreciate your feedback; we had not inspected this home for a while, but we have done so as a result of your review. 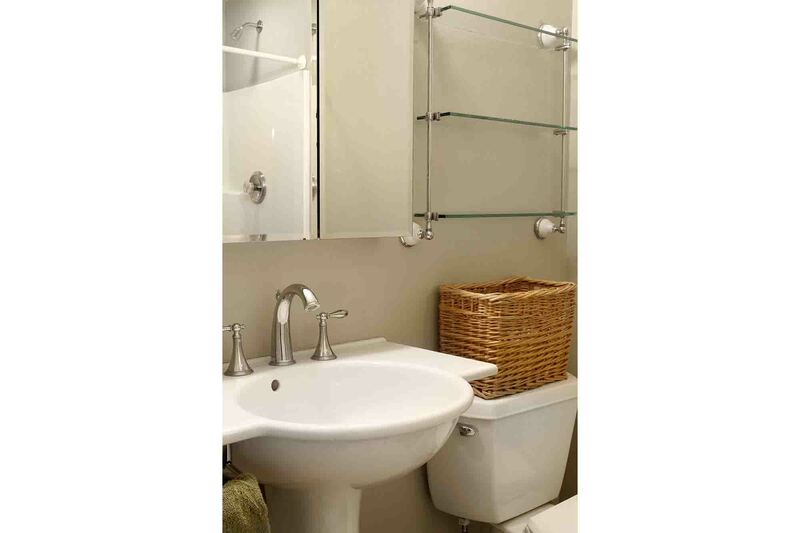 The owner is moving quickly to remedy all of these items; we do require that our homes be maintained beautifully and this one will not be an exception in the future. Update: the window has been replaced, the entire interior is being painted and will be completed May 15, the grill has been replaced, and the roof and decks blown. Everything is now A-1. 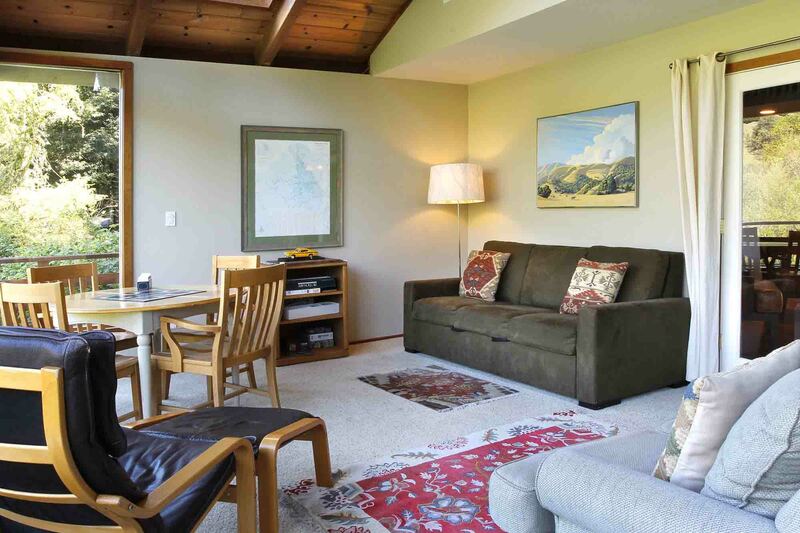 Russian River Getaways has always been over delivering a great service on house rentals of a very high standard, and this is the level of service we are used to. That said, I wanted to share that "Amazing Place" did not live up to our usual expectations. The house was not spotless clean, with especially a lot of spider webs in the sunroom, the garbage can in the kitchen was broken, and not really clean either, and we had to go buy some liquid drainer for the upstairs bathtub, drain issue that could not have been unnoticed at the last cleaning. Besides, not having firewood is one thing, not having an axe is quite inconvenient. I hope this feedback helps to keep rrgetaways.com the place to organize great week-ends. Lilie, we are mortified about the condition in which you found Amazing Place, a truly lovely home. Our inspector who is in charge of deep cleans had scheduled the home of its deep clean a month earlier and thought it had been done. After your complaint, he contacted the cleaners and found out it had not been done---his fault for not tracking it better. Our homes are generally spotless and this lapse is very embarrassing to us.